La Perla is a true pearl in the picture perfect valley of Corvara. Experience genuine Italian mountain hospitality, combined with distinguished luxury! The hotel is a located on the side of the slopes and is therefore, a perfect Italian ski-inn ski-out hotel. La Perla breathes a sporty and classy atmosphere and the property has been owned by the family Costa for centuries. Today the Costa family is still running Hotel La Perla with pride and passion. Hotel La Perla is a story of romance, hospitality, great taste and talent. From a culinary point of view La Perla has you covered. The hotel boasts a 1-Star Michelin awarded Restaurant called La Stüa de Michil. Besides this culinary gem there is Les Stües, your home away from home that serves authentic, honest food. The restaurant is (included in your half board package), is under the culinary supervision of chef Nicola Laera, expect simplicity and South Tyrolean tradition using local and organic produce with creativity, flair and expertise. Than there is Bistrot La Perla, serving you from South Tyrolian modern classics, to the Mediterranean cuisine. The hotel also offers dining at its other venues in town called restaurant Ladinia and the L’Murin Tavern. With such a abundance of luxury, it is hard to create a spa that meets the same luxury level but we assure you the spa at La Perla is pure pampering, besides the regular amenities and sevices like a pool and so on the spa offer an extended massages- and treatments menu that make you feel and look as good as new. La Perla is a slope side piece of heaven, expect being home away from home but with many extra's making your stay more comfortable that you might suspect it will be. Just sit back, relax and...do not lift a finger, the staff will take care of you leaving you with an unforgettable experience and happy memories. The hotel is widely known for its superb restaurant. As the Italian cuisine already sets the bar to the highest level, the Michelin star restaurant is outperforming on all culinary levels and offers a memorable dining experience in a comfortable setting. There are 2 'must-see/must-do' experiences at La Perla, a beer (or more) at L’Murin after skiing as this is the resort's hottest place for a good apres ski party. Other thing you must do is pay a visit to one of Italy's most unique wine cellars. The collection is just as outrageous as the design! The Alta Badia skiing area offers winter sports on 130 kilometres of carefully groomed ski-slopes of diverse degrees of difficulty, a snowboard fun park and three toboggan runs. Besides wintersports you can go for a wine tasting tour at one of the many great local wine producers accompanied by the best Italian food. 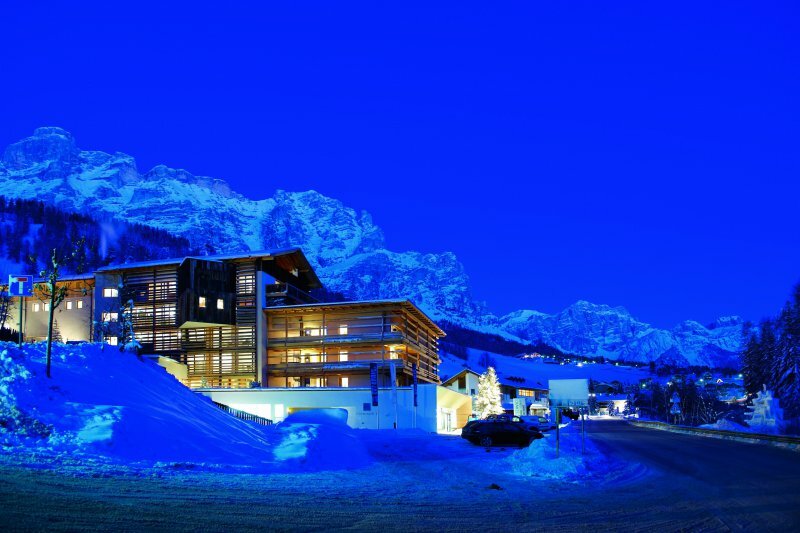 A one of a kind, award winning boutique hotel with a rich history in the heart of San Cassiano, near Alta Badia and Cortina d'Ampezzo. Lagació Hotel Mountain Residence is a perfect blend of high Alpine contemporary design and authenticity. 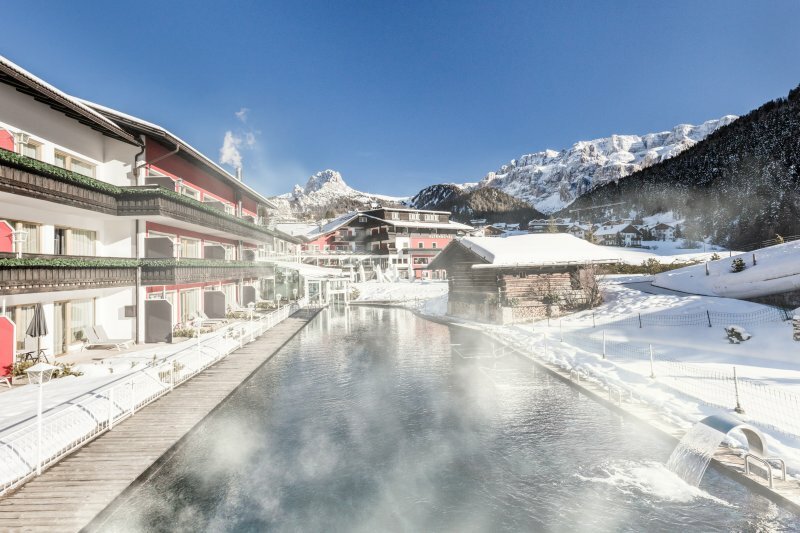 The Alpenroyal Grand Hotel is heaven's playground for spa lovers, foodie's, skiers and those who love the finer things in life.